Rediscover entertaining with our dining and kitchen furniture. 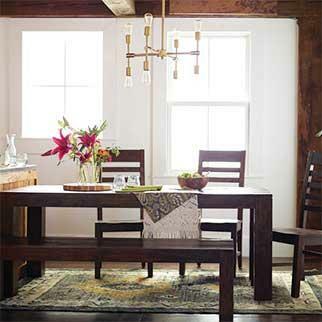 Find dining tables, chairs and benches in rustic, contemporary and unexpected designs. Bring home style and comfort in your living space. 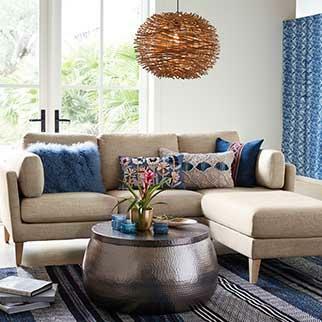 Get ideas and shop for living room furniture, sofas, sectionals and coffee tables. Style meets functionality with our home office furniture. 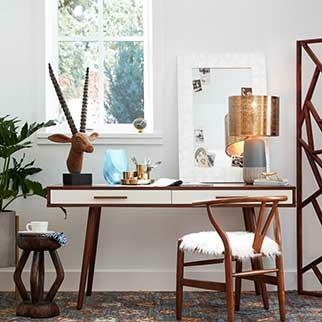 From office desks and chairs to wood bookcases, we have tons of chic home office ideas. Bring home a retro look with our Mid Century furniture. Find sofas, chairs and tables mixing throwback style with modern lines at unbeatable prices. Make a small space feel big with table collections sized for apartments, ottomans for compact lounging and bar carts for style and storage. Create a backyard oasis with our outdoor, patio and balcony furniture, Adirondack chairs, hammocks, and fire pits, all at prices you’ll love. 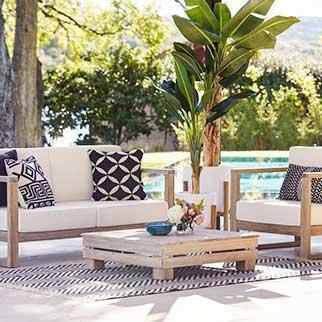 Step into World Market to discover affordable furniture for every room in the home. 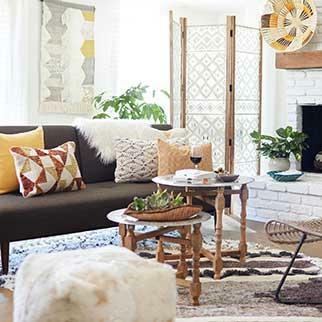 Outfit your living room with the basics and beyond on a budget. Whether your style is modern, traditional, mid-century or a mix all your own, we've got you covered. Browse our array of plush sofas, from loveseats to three-seaters to sectionals to find just the seat to sink into. Add an upholstered accent chair or armchair with an ottoman or footstool to complete your seating arrangement. Come in, have a seat and feel the comfort for yourself! We offer coffee tables crafted of metal, glass and wood in designs that range from sleek and minimal to substantial with storage options. 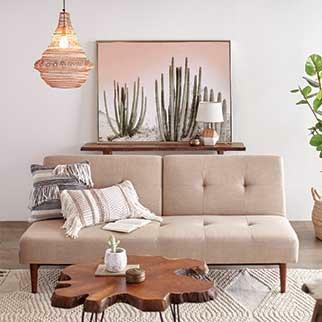 Accent and occasional tables provide a perch for lamps and tabletop decor to make your place pop. Opt for a handcrafted drum table to add an eclectic flair to your decor. For small spaces, we have nesting tables and consoles for additional surface space and decorative displays. Looking for a kitchen or dining room revamp? Browse our handcrafted dining tables in a range of rustic and contemporary finishes and both fixed and extension designs. We've curated handpicked furniture collections complete with matching side chairs and benches to create a put-together look effortlessly. For kitchen seating solutions, our upholstered barstools and counter stools offer a seat for every style. You'll also find storage for daily meal prep and entertaining essentials like sideboards, rolling bar carts, kitchen carts and wine cabinets. Fashionably organize your entertainment area with a media stand that offers drawer, shelf and cabinet storage to keep electronics and accessories neatly tucked away. Many of our TV stands feature cable management systems for a clean look, and can even double as a sideboard in the dining room. Transform your bedroom into an oasis all your own with our affordable bedroom furniture and decor. Browse our assortment of industrial wood and metal beds, traditional beds, canopy beds and more to find the bed of your dreams. Already have a bed and simply looking to top off the look? We offer an array of headboards to bring your room together. When it comes to keeping a tidy bedroom, storage is key. Shop dressers in a range of sizes and number of drawer offerings to organize clothing. A storage bench at the foot of the bed doubles as a seat to put on or take off shoes with handy space for extra bedding and linens. Opt for a jewelry armoire to store bracelets, earrings, necklaces and all of your precious pieces. Of course, no bedroom sanctuary is complete without a nightstand. Not only does it provide a surface for a bedside lamp, a nightstand also adds convenient storage space for magazines, books and more. Don’t let the decor update end at the bathroom. Explore our assortment of bathroom storage including cabinets, carts, handwoven baskets and caddies for all of your grooming essentials. We also offer a range of hampers that provide easy transport of laundry and help keep dirty clothes out of sight. Still having trouble envisioning your finished space? Come in for inspiration and you might just find more than you were looking for.